So While monitoring seabed survey our main flying overlay screen picture quality was getting bad and overlay also started giving garbage values as luckily as we had lot of time before starting project so we decided to recover and our first suspicion was overlay card so replaced with a new one and bang on overlay was back and we started dive again and 40 minutes we had same problem again of video quality going bad to worse that we were not able to fly using overlay screen at the same time so time to recover again and now its not the card and also the another factor was time as video quality was only going bad after 30-40 minutes it means either power supply supplying the overlay circuit is getting heat up and dropping voltage so there might be a chance that there is not enough cooling in Surface unit or our LASCAR Power supply#1 has gone bad. So this problem which was time bound and occurs after a certain period check for cooling or power supply itself. Hope this small experience of mine which i hope will help some of you. So It all started with replacing tether drum on Panther, I was day shift supervisor and we had two day weather window before barge starts laying next pipeline and we decided to replace tether drum as we had only 28 units left on drum and everything went smooth as we managed to complete both TMS JB and ROV JB side pretty quick as everything was running on Copper wires. After deck checks i started system configuration and after configuration i realized two aft thrusters stopped working, So i started configuration again and after configuration we got error of Surface subsea comms lost. So we restarted system and everything went normal again and deck checks done but still again surface subsea comms lost. So first thought in mind was may be loose connection in one of JB as that is only thing we opened last and we had good look on twp in both JB and it was fine there so we ruled out loose connection. Next place to look was to start logical troubleshooting from top side so i checked LASCAR power supply #1 which supplies 5V to CPU on top side and it was 5V on backplane as we were checking voltage we got Video communications link lost now this error means top side cpu and video processor are unable to talk to each other as we were sure about power supply, we thought its either CPU or video processor so tried replacing both but still result was same we still had intermittent surface subsea and video comms lost. At last i opened subsea electronics pod as there might be a chance of subsea processor going bad or power supply not adequate, In pod power supply was ok and replaced processor as well but made no difference. We still had surface and video comms turn by turn and occasionally system will run perfectly without any problems. When one of the techs were inspecting weather cards are pushed in backplane properly he realized backplane is loose and it was that back plane which was giving us intermittent comms and video link lost. This is my first post regarding troubleshooting seaeye but i will keep on updating on weekly basis, Please do comment or follow if you like blog. I am working on Seaeye systems from last couple of years now and from this post i am going to share some of the experiences which i had with Seaeye (Panther, Panther Plus, XT). Any Opinions, suggestions or criticism are more than welcome. Please do comment, like or follow if you find this blog useful. Loopback-A very old and fool proof trick in books is loopback as we discussed earlier in posts about protocol. So if i can short Tx and Rx lines at any receiving end i should get back what i am sending. This test i can use Main pilot computer in control van in which telemetry software is loaded or your personal laptop or work pc. Personal laptop or work pc are used in case you want to check the continuity of the circuit in case pilot computer is not a part of circuit for example-Sonar running on Fiber optics is completely isolated from pilot pc so to check this circuit we need to do this test via PC. As your PC also sends out RS-232 via USB ports or if you are lucky you will have Desktop with DB-9 connector and if not you need USB to Serial port convertor(DB-9).You can either buy it from any electronics hardware store or make one yourself if you are offshore, Just search on google how to do it. Now when you will click on hyper terminal it will ask you to make telenet a default program for your computer,Select NO and then a box will appear asking for country code and number-click on Cancel. Then finally a box will appear(As shown below) asking for connection name,Fill in XYZ whatever you like and click OK.
Then a new Box will appear as shown below and instead of TCP/IP select port 1from connect using Drop down menu. Once you click ok another box will appear asking for PORT settings,In these settings the first one is selection of speed or Bits per second,You can choose according to your system Modern ROV's like SMD or Even old sea eye's mostly use speed of 115200bps,Select from the drop down menu which suits you the most. Another parameter is Flow control at bottom,Select None from drop down menu and that's it no other option we need to change. We are ready for test our sonar circuit. Click OK and a new blank notepad type window will appear,Start typing any rubbish, Until and unless you short Transmit and Receive line you will not see anything on screen because in hyperterminal you can only see what you are receiving but you cannot see what you are sending. When you will create a short between Tx and Rx on sonar plug,If your circuit is fine till that point you will should see what you are receiving and if its a open circuit in between you will have a blank screen. You can apply this technique on any equipment as your PC serial port also gives out RS-232,Which is a full duplex protocol. As requested by some viewers here is the pin description of Wago. I recommend before you start reading this post please read the post about basic Information of Focal 903. I will first start with surface unit as this unit is easily accessible to techs and discuss various LED's and indicator and their use while troubleshooting. Fuse-There is a 1 Amp fuse at the back of this unit and if you are running on fluctuating power supply this is the only protection this unit has so if this unit is not turning on,Please check this fuse. 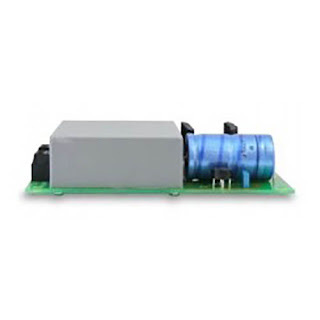 Power Supply Indicator-The Power supply module has 3 LED's on it which displays three out put voltages of power supply,As this unit comes with different types of power supply depending on model and requirement but most commonly used one is the one with 240 V input supply and output of +12v,-12v,+5v and you can check the output by looking at the glowing led's. Note-Power supply for focal unit can be operated on 120v or 240v,Some power supply models comes with auto selector function while some power supply has manual switch in it to select the voltage and to access this switch you need to open power supply cover. Tx and Rx LED's on data channel-This is my favorite as from this you can tell which side of focal 903 has problem. When telemetry is working fine both RED and GREEN led's will blink continuously telling you that focal is receiving and transmitting data. In surface focal unit RED led represents local computer and Green led represents remote computer(POD),So if your green led is blinking and red is not,This condition represents that pod is sending data but computer in control van has problem. So just by looking at these led's a technician can tell which part has problem surface or subsea. Note-These LED's should be blinking and not solid on, As blinking led represents data transfer and some systems have high data rate and led blinks at such a fast rate that led appears to be solid, so watch it carefully. LINK LED-Link LED represents that focal unit is receiving enough optical power from other end and fiber is GOOD but this does not represents that telemetry is working. Diagnostic Port-There is a separate post about using focal 903 diagnostic port,Please refer to that post. Video Signal-when focal receives a video signal led related to that particular channel will blink and indicates video signal is being received. How to test daughter card on AIB backplane-Take a Fluke multimeter(Only fluke) and select diode mode place black lead on the bottom most pin and red lead on the second pin (Last two pins) and red led will glow and indicates daughter card is working fine. Note-This is only applicable for RS-232 data card. If daughter card has gone bad you need to replace it,Please make sure you take precautions while handling cards as daughter boards are sensitive towards electrostatic interference. Note-when replacing daughter card on AIB module please align the white dot on card as well as on backplane as daughter card can be fitted both ways. Subsea unit has a 3Amp fuse on back plane and when this fuse blows and you don't have spare one no need to worry,Open backplane and there will be another fuse fitted as SPARE fuse. Link LED and Video led's have same function as on top unit.the only difference you will find that the subsea unit is a high density unit,Hence smaller in size. Another measuring instrument for fiber optics and much easier to use as compare to OTDR but will not give you much details as OTDR. Most of the light source can transmit laser at 850nm,1310nm and 1550nm and depending on your system you can choose the wavelength required. I will choose 1550nm because all the systems i worked on has Focal 903 and downlink wavelength in focal 903 is 1550nm. Once you have selected wavelength in light source choose the same wavelength in power meter as well. Take calibration cable and fix between light source and power meter,Switch ON both devices and note the reading in dB,I prefer it in dB because its easier for me to calculate but you can do it in dBm as well but make sure to do calculations accordingly. You must see reading of about 65dB-75dB and if battery of any device is low you might get an error reading so be aware of this. Note down the reading as this is our benchmark lets suppose 70dB(Benchmark reading) in this case. and Power meter at the subsea end as this for illustration purpose only you can even place a particular junction box in between. So in this case we have loss of 10dB in whole system from Surface to subsea. You can use this method for a particular connector as well, by placing a connector in between instead of whole system.